I've gotta admit, we are an apple family. Pumpkin spice is great and all, but apple is where it's at. I love apple crisp, and my father makes the smoothest apple cider I've ever tasted in my life. I remember going to a cider mill in school and learning how they squish apples to make apple cider, and at the end of the day we all enjoyed apple cider donuts. I remember apple cider donuts being at the core of all gatherings as a school aged kid. Perhaps being from Upstate New York contributes to my love of apples, and all the joy it can bring to your life. It was never only about the apples themselves, but the memories they brought with them. Apple picking with my husband is one of my favorite memories I have in New York with him, and it helped him enter into the world of loving apples. You can enjoy the crisp, cool air, as well as the beautiful changing colors of the leaves before winter falls. I want to share this love with my children so they can fall in love with my home, the land of apples, and they can learn about them too. Well hey! I use affiliate links in most of my posts, so some of the links you click might give me a small commission. This doesn't cost you a thing, but helps my family and keeps this blog running. Thank you! My favorite way to tell my children about things is to give them books. We learn so much, even things I don't already know through the books we find at the library or on Amazon. Here are a few of my favorite autumn / apple books. These two are nice easy reads for boosting the confidence of our your early elementary child. They can quickly learn some of the more difficult vocabulary, and then be able to read you the story. This teaches children about the process of making applesauce, and explains how this family has a special pot they have handed down through the generations to make applesauce in. I love it because it gives you a great, child friendly tone, and explains how applesauce is made. This book is a more technical, and less about telling a story. If you want the facts of how apples are made, pick this up. My son loves learning about flowers . . . I would even say he's a budding botanist, so he loves books like this and learning about the aspects of how the trees grow. This one is popular among teachers when introducing apples and fall to their classrooms. It introduces Johnny Appleseed and talks about the pollination, and how apples are made. I am a huge fan of Giselle, and the awesome Kid's Yoga books she puts out. They give you a story as well as introduces simple and fun yoga poses to your children. My daughter LOVES them, and loves trying out all the yoga poses she learns while we read the stories to go along with them. This is a fun chapter book for early elementary school aged kids. Amelia Bedelia is a household name, and a classic favorite. We usually read chapter books before bed most nights. They're a great way to get lots of reading time in, and helps your child with reading comprehension. A book roundup would't be complete without a cute little story, right? This one is about a little apple who becomes friends with a worm. This leads to a lot of bullying and people telling that little apple he shouldn't be friends with a worm. Have you tried Amazon Prime yet? Because it will change your life if you haven't. Click here to get a free thirty days. There are so many benefits you'll love. Give it a try! Later this week we're going to talk about apple crafts and apple learning. 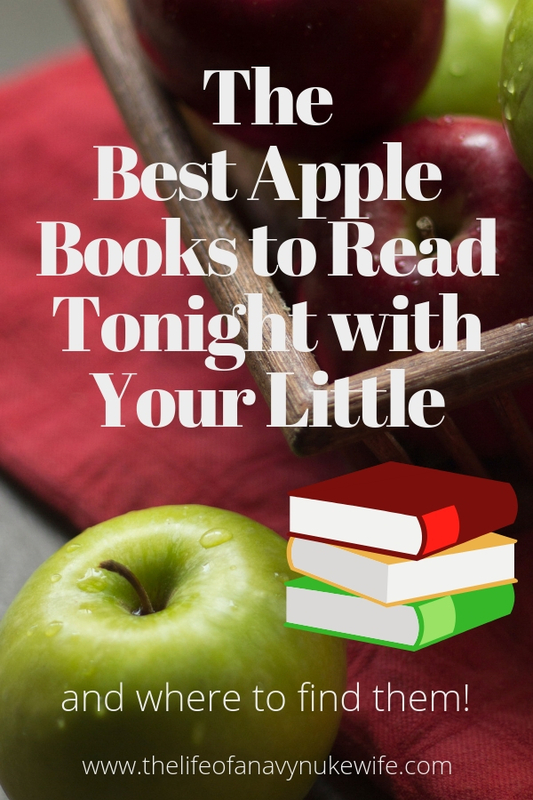 What are your favorite apple books?